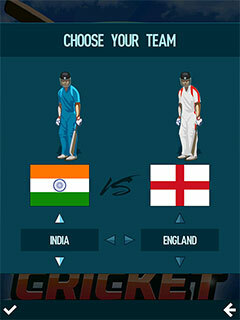 Pro Cricket 2019 is a simple sports game based on reflex and skill. Play for one of 8 national teams in single matches or world tournaments. Charming old-school visuals and addictive skill-based gameplay will keep you immersed! Win a tournament against other national teams in elimination rounds and become the world champion! Standard Cricket rules apply. On the Bat – Press 5 at the right time to hit the ball with the best shot. Strong hit - If you hit the middle part of the bar while delivering the stroke twice in a row, the bar turns red. If you hit the center again, you may score 6 runs by swiftly tapping the key number presented on the screen. Throwing the Ball – press keys 1 and 3 in correct order as fast as possible to finish the throwing sequence successfully. Running on the pitch – When your stroke was successful, run with your batsman to the opposing side of the pitch by pressing 5. Score as many runs as possible. Watch out for the opposing team's players to out run out your batters! You may cancel the run by pressing5 again. key at the right time! 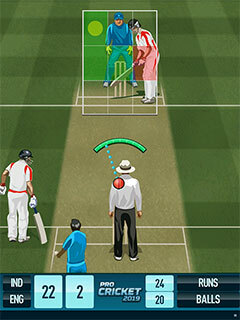 On the Bat – Tap anywhere on the screen at the right time to hit the ball with the best shot. Throwing the Ball – press the buttons in correct order as fast as possible to finish the throwing sequence successfully. 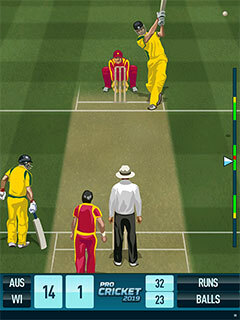 Running on the pitch – When your stroke was successful, run with your batsman to the opposing side of the pitch by tapping anywhere on the screen. Score as many runs as possible. Watch out for opposing team players to out run out your batsman! You may cancel the run by tapping the screen again. Playing as the fielding team – when opposing team's stroke is successful, tap a player you wish to run for the ball. If he gets to the ball before it hits the ground, you may be able to catch the batsman out by tapping the sceen at the right time! "